Fans of the No. 1 Ladies' Detective Agency will be happy to see there are new adventures for the hardworking sleuths in The Woman Who Walked in Sunshine. The detective agency is pretty much in the same spot where we left it: co-managers Mma Ramotswe and Mma Makutsi, and assistant Charlie are waiting in the office for clients to appear while drinking endless pots of red bush tea. All this changes, however, when Mma Makutsi gets it into her head that Mma Ramotswe needs a vacation. It's never easy to argue with her, and when Mr. JLB Matekoni, Mma Ramotswe's husband, endorses the plan, there seems to be no option but to take time off. Luckily, Mr. Polopetsi, who teaches part-time at the local high school, is called upon to fill in during Mma Ramotswe's absence. Soon this enforced leisure begins to take its toll on Mma Ramotswe. Just why, she wonders, was Mma Makutsi so insistent that she remove herself from the office? Is she planning a takeover of some sort? This seems unlikely, as Mma Makutsi is already a partner and is married to the successful furniture store owner Phuti Radiphuti. Still, the whole thing doesn't sit well . . . The opportunity for dropping by to check on things crops up, and her visit to the office does nothing to calm Mma Ramotswe's fears. Mma Makutsi seems to be acting in a rather strange and secretive manner, although she insists nothing is wrong and she has everything under control. 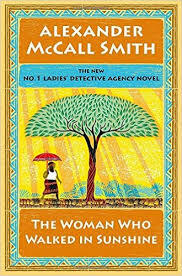 Luckily, Mr. Polopetsi contacts her with a plea for help, and that gives Mma Ramotswe the opening she needs to immerse herself in the current case, which involves trying to find out if there is any scandal attached to a Mr. Government Keboneng, who is recently late. The case seems a little complicated, so why would Mma Makutsi pawn it off on the relatively inexperienced Mr. Polopetsi? At the same time, the evil Violet Sephotho makes an appearance as she tries to steal some of Mma Ramotswe's thunder by opening the No. 1 Ladies' College of Secretarial and Business Studies -- a development that offends Mma Makutsi as well (as a proud graduate of the Botswana Secretarial College). And the tiny white van is still going strong, although, as usual, it suffers some injuries in the course of the adventures of its driver. As always, it's wonderful to take a step back and enjoy a visit with the beloved cast of characters in Zebra Drive and Tlokweng Road. The people are friendly, their manners polite, and there's no problem so big that can't be solved over a cup of red bush tea and a slice of fruitcake. I'm anxiously awaiting the next adventures of the No. 1 Detectives!